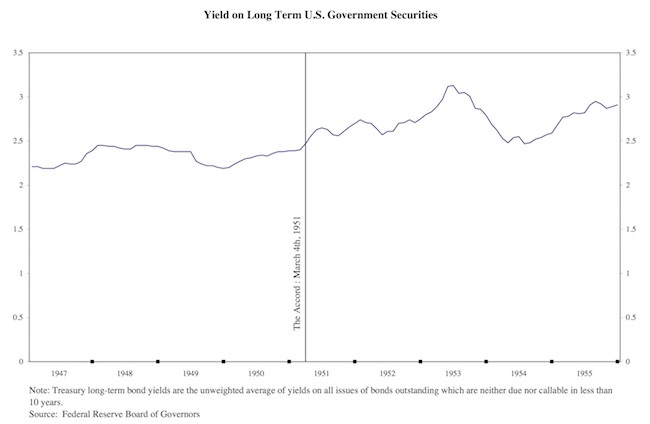 The first graph shows the yield behaviour of long-term government bonds from the end of WW2 to the late 1950s. The vertical line (Treasury-Fed Accord) marks a discrete shift in policy, which we will discuss in this Part and the final Part of this mini-series. Clearly, the pegged arrangement was effective (it was abandoned, as we will learn, in 1951). The US Federal Reserve Bank was not necessarily a willing partner in the arrangement to peg government bond yields. All organisations have their own dynamic even if they are part of a consolidated entity (in this case, the government). The dynamic within the central bank saw it increasingly concerned about what they constructed as being a loss of control of their balance sheet and the inflation threat they perceived as following from that. It was a strange way to think. The more reasonable construction was that the Treasury reflected the democratic will of the American people and was subjected to the electoral cycle and that the central bank should use its constitutional capacity to serve that mandate as best it could. The idea that pre-conceived ideas about the size of the balance sheet should become a self-serving objective in isolation of the broader public purpose was not sensible. But the conservative forces exploited fears of inflation (as the central bank’s balance sheet increased via its on-going government bond purchases) to pressure the US Treasury into abandoning the pegged arrangement. This is despite the obvious empirical fact that it had kept yields low. 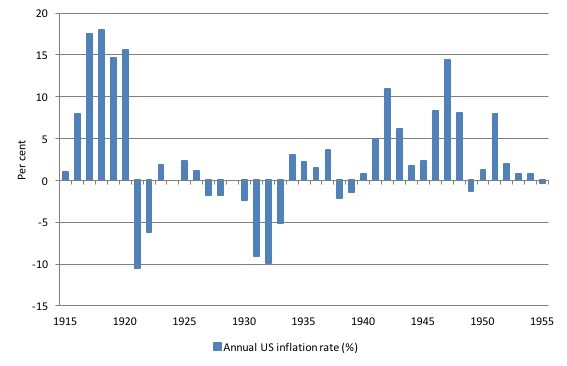 The following graph shows the annual US inflation rate from 1915 to 1955 (per cent). While there was some immediate Post-WW2 inflation, as there was in almost all countries given the shortages and the transition back to peace and the abandonment of rationing systems, the situation had stabilised until the onset of the Korean War in 1951, a year in which the inflation rate rose by 7.9 per cent. However, there was little to tie the arrangement between the Federal Reserve and the Treasury to the inflation spike. It was believed that selling bonds to the non-government sector reduced the inflation risk of running fiscal deficits whereas ‘selling’ them to the central bank, which was effectively what was being done during the pegged arrangement increased the risk. The reality is that neither arrangement with respect to the bond sales changed the inflation risk inherent in the government net spending. If the government competed with the non-government on price for resources in the market then price pressures would emerge, whether they matched their deficits with bonds or not. 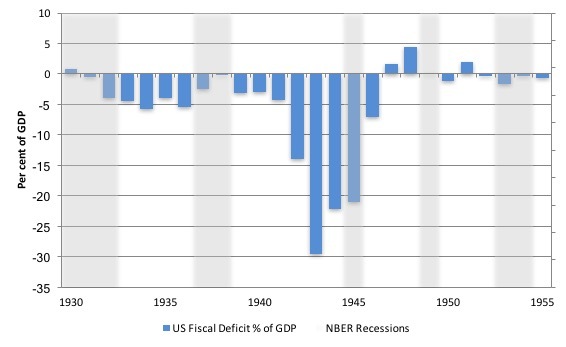 The next graph shows the US Federal fiscal balance between 1930 and 1955 (and the gray bars show the NBER recessions). By the end of WW2, the government was contracting fiscal policy and that effort caused the recession in 1945. The austerity continued and recession returned in 1949. But the Korean War effort saw fiscal policy return to deficit in 1950. It could hardly be said that the fiscal shift was extreme. The growing tension between the central bank and the Treasury mounted in the early 1950s and came to a head at the Federal Open Market Committee (FOMC) meeting held on August 18, 1950. The Minutes show that the FOMC began by considering a letter from the Secretary of the Treasury which was dated July 31, 1950.
outlined serious problems now faced by the Federal Open Market Committee in maintaining an orderly market for Treasury financing. My letter explained why, in our judgment, it was urgent that the Treasury make an early announcement that it had decided to raise funds by means of a long-term 2-1/2 per cent nonmarketable issue on a tap basis. A tap issuance refers to the system whereby the Treasury would announce an issue of debt and issue however much was demanded at a set yield. This is in contrast to an auction system where the volume of debt issued was fixed and the bond dealers would then set the yield as an indication of what they were prepared to pay for the debt. Importantly, the central bank wanted it made clear that the Treasury would not call on central bank funds to participate in the tap issue. We think it will greatly contribute to confidence in the value of the dollar and hence in Government bonds to offer such a tap issue. It would signalize the Government’s purpose to rely primarily on nonbank financing, thus avoiding as far as possible resort to the highly inflationary process of financing through the banking system. Experience has shown that it is not technically difficult for the Treasury to raise money by selling securities which are either bought directly or indirectly by banks, provided the Federal Reserve supplies banks with the necessary reserves. The market and the public are now fully educated to these technical possibilities and they know that a procedure of this sort feeds the fixes of inflation. The FOMC was convinced that the non-government bond market would soak up all the debt that the Treasury would need to issue to match its deficit as the military expenditure associated with the Korean conflict escalated. … going to do about making further reserve funds available to the banking system in a dangerously inflationary situation. They discussed the need to tighten up on credit availability via higher interest rates. The FOMC discussion reveals that, while Sproul had sought short-term interest rate increases, there was a feeling that “a much broader program was needed”, which would include increasing the “discount rate” (the rate the central bank supplied reserves to the commercial banks), increase “reserve requirements” and more. He also noted that pushing up the short-end of the yield curve would have the beneficial effect of pushing up long-term rates as well. After further discussion, the FOMC determined to reconvene later after Chairman McCabe had visited the Treasury at 14:00 to consider the Treasury funding position. The reconvened meeting of the FOMC reaffirmed its intention to push rates up to slow down domestic spending, given the escalating war expenditure. They signalled that McCabe and Sproul would meet with the Secretary of the Treasury (Mr Snyder) at 16:30 that afternoon to inform him of their leanings. … purchase for the System open market account direct from the Treasury of such amounts of special short-term certificates of indebtedness as may be necessary from time to tie for the temporary accomodation of the Treasury; provided that the total amount of such certificates held in the account at any one time shall not exceed $1,000,000,000. But at this stage, the Federal Reserve Bank was still operating under the pegged arrangement and stood ready to absorb any shortfalls in demand for Treasury bonds. There were two meetings of the Federal Reserve Open Market Committee (FOMC) on January 31, 1951. The first, at 10.00 The FOMC considered “its institutional arrangement with the Treasury Department” while the second, at 18:45 followed a meeting with the President (Truman) at the White House. 1. Federal Open Market Committee, Minutes, 6:45 p.m..
2. Federal Open Market Committee, Minutes, 10 a.m. The records record that this was “the first between a U.S. president and the committee”. At the earlier meeting, it was noted in response to the latest Treasury bond issue that “demand for such bonds was not sufficient to absorb the supply, vith the result that approximately $30 million of bonds were purchased for the System account”. They had purchased the gap to maintain “an orderly market” (that is, to stop the rates falling and maintain the peg). As fiscal agent of the United States, you are authorised and requested to purchase for account of the Postal Savings System not more than two hundred million dollars Treasury bonds December 1967-72 at par and 22/32nds, plus commission, at such times when open market purchases are not made at this price for open market account. In other words, the FOMC was being instructed to conform with Treasury wishes to maintain the pegged yields. McCabe and Sproul had private meetings with the Treasury during January 1951 and had expressed their inflationary fears and their belief that credit had to be constrained and the provision of bank reserves tightened (and made more expensive). … the Treasury will face a prob- lem unless it offers a higher long term rate. In other words, exhorting the Treasury to abandon the pegged yield agreement. Truman had told McCabe that “he hoped we would stick rigidly to the pegged rates on the longest bonds”. I hope the Board will realize its responsibilities and not allow the bottom to drop from under our securities. If that happens that is exactly what Mr. Stalin wants. I found the reference to Stalin to be very interesting and it has prompted a lateral document search, which I may report on another time, when I have a better view on the developments. But it was clear that the government was caught up in Communist scaremongering and saw it as a way to pressure the FOMC to take instructions from the Treasury. … that we have faithfully followed the policy as outlined to you. But he restated his view that the pegged yield arrangement was distorting the market and allowing inflationary forces to percolate. McCabe sought a meeting with the President to reach an understanding about this growing tension. That meeting took place on January 17, 1951 at the White House. The Secretary of the Treasury was in attendance. The President restated his wish that the 2.5 per cent peg be maintained on long-term government securities. Both the President and the Secretary wanted the parties to the agreement to “let the public know that the 2-l/2 per cent rate was going to be maintained” as soon as possible. There were subsequent interchanges over January 1951 between the parties, which all added to the tensions. It was clear McCabe was annoyed with public statements that Snyder had made, which seemed to ignore the interactions between the bank and the Treasury. All of this was part of the core discussion at the morning meeting on January 31, 1951. The FOMC were then informed at that meeting that the President wanted to meet with the full FOMC at 16:00 on the same day. The FOMC moved to discussing tactics in response to their speculation on what Truman might be about to say to them. 1. Confirm the FOMC would continue the pegged arrangement but issue a public statement that the FOMC “as acting in response to a specific request of the President during the emergency” – which would “leave the Federal Reserve with nothing to do in the field of general credit controls” and reduce its capacity to control inflation. 2. Publicly announce that the FOMC would abide by the peg unless “changing economic conditions” (inflation etc) required a different policy response whereby the FOMC would inform the President and the Treasury and require a conference between the parties – which would be “equally as bad” as Option 1. In other words, Option 3 would seriously up the pressure on the President to abandon the peg and allow the Federal Reserve to run its monetary policy as it saw fit. The subsequent discussion highlighted the FOMC’s distrust of Secretary Snyder who they believe was behind the President’s request for a meeting, which would tell the FOMC that they were there to do the President’s bidding not the other way around. Allan Sproul considered Options 1 and 2 would not allow the central bank to “do the main Job Congress had given the System to do … to maintain public confidence in the real value of the dollar”. … ask for a new set of rules to govern the Federal Reserve System because it could not continue on the present course which involved either continued open conflict with the Treasury or complete abdication of the responsibility of the members of the Federal Open Market Committee. that course” but would be effectively servants of the President. The meeting with the President then resulted in further documentation from the FOMC. if people lose confidence in Government securities all we hope to gain from our military mobilization, and war if need be, might be jeopardized. Which I found hilarious – the ‘reds under the beds’ scaremongering to pressure the Federal Reserve to play ball with the Treasury! But, moreover, it was interesting that the President considered public confidence was ensured if the central bank used its capacity to continuing buying government debt. That sort of statement would not be made today in this vehement, neo-liberal era. After the meeting, without consultation, the White House issued a statement saying that “The Federal Reserve Board has pledged its support to President Truman to maintain the stability of Government securities as long as the emergency lasts”. The later meeting that day (January 31, 1951) of the FOMC executive members just confirmed what had happened that day and that the Federal Reserve System would continue to buy Treasury securities to stabilise the Government securities market (the peg) but would limit the contribution (as above) to $US1 billion. The next meeting of the FOMC was on February 6, 1951. Here the mood sharpened as a result of reported leaks from the FOMC about the nature of the meeting on January 31 between the President and the FOMC. An FOMC board member (Mr Vardaman) had requested another member (Powell) approve the release of a public statement recounting the meeting. Powell refused because the statement “contained the names and views of individual members of the Board” and should be approved by the full Board. Vardaman rang Powell, saying that unless the latter “wished to assume the responsibility for throttling another member of the Board in the expression of his views” he should call a full Board meeting “to consider the matter”. The subsequent Board meeting approved Powell’s actions because Vardaman had apparently expressed disatisfaction with McCabe’s handling of the matter with the President, specifically, Vardaman’s impression that McCabe “had given President Truman every reason to believe that the Committee and Board would support the Government financing program” and the Board’s failure to release a clear public statement to that effect”. The inference was that the FOMC really was trying to abandon the peg and push up rates and to present itself otherwise would be not only misleading the President but also the public. Vardaman was questioned about a media article published the day before (February 5, 1951) which seemed to have inside knowledge of the interactions with the President on January 31, 1951. He denied leaking any information to the press. Another Board member (Evans) put it on the public record that he thought Vardaman was lying. Vardaman just responded by saying that he disagreed with the Board and wanted “to make his position clear” in the media release. But it is clear that at this stage things were falling apart. In Part 3 we will reach the conclusion of this affair and examine what was really going on behind the scenes, including the role played by Wall Street bankers intent on pressuring the New York Federal Reserve Branch to do its bidding. At present, I am writing this from Kansas City where I will be presenting several sessions at the – First International Conference of Modern Monetary Theory. The Conference Program details times and sessions. I am told that there will be live streaming of the sessions. When there is a reliable link available I will make it available in one way or another. Bill, the way you put it seems that some conservative politicians meet in one roon and said “hey, what’s the best way to undermine society’s well being?” “I don’t know, but we could think of some accord between the Treasury and the Fed to achieve that”. But I don’t believe that’s an accurate version of the history. I think that the politicians and mainstream economists indeed believed that this kind of US-Fed constraint would avoid uncontrollable spending and inflation. They were ignorant, but not evil. Again, we must make a distinction between the evil and the ignorant, because the solution for evilness is not the same solution for ignorance. Nonetheless, that was an excelent post. Could you comment on why the Fed feels it must unwind its balance sheet. All I hear is “to normalize.” But why? What if they just left it the way it is indefinitely? Is there a reason to unwind it? Andre, we mustn’t neglect functional stupidity, where the organization can be stupider than the individuals who make it up, so well analyzed in The Stupidity Paradox by Mats Alvesson and André Spicer, one of the authors having the same first name as yourself. An amazing coincidence. larray, I have never heard of the “Stupidity Paradox” before but it seems interesting. I will take a look at that book. Also, just before the US entered WW2 the US Federal Reserve Bank was authorized by Congress to purchase War Bonds in large amounts. Although private citizens, institutions, corporations and banks did purchase War Bonds, the Federal Reserve Bank was the largest single purchaser, I believe. However, I haven’t been able to find any record of how many bonds they purchased by year or total during the war. This could be a good research project for a researcher interested in MMT to see how MMT would explain better those purchases and how they affected the economy. That authorization must have ended at some point, but, again, I find no record of that.